or blacksploitation is an ethnic subgenre of the exploitation film, emerging in the United States during the early 1970s. Blaxploitation films were originally made specifically for an urban black audience, but the genre’s audience appeal soon broadened across racial and ethnic lines. Of course, films aimed at black audiences appeared almost immediately after the invention of film. What made Blaxploitation different is it was also marketed to white people. That meant Canadian television stations desperate for content bought the rights. 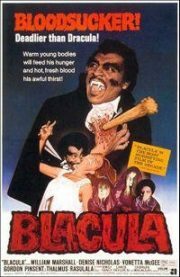 Which in turn means I got to see an edited for TV in grainy black-and-white broadcast version of Blacula. Determined to end the scourge of slavery, Prince Mamuwalde (William Marshall) appeals to a European aristocrat in the hopes the aristocrat will use his influence in the cause of anti-slavery. The African Prince is apparently quite poorly informed about European politics in the year 1780 because he has pinned his hopes on the benevolence of Count Dracula. Dracula amuses himself by turning Mamuwalde into a vampire before sealing him in a coffin to starve undying for centuries. Mamuwalde’s unfortunate wife Luva is sealed in the same locked room with Mamuwalde’s locked coffin, starving to death as her helpless husband listens. By 1972, Dracula is only a legend and nobody has any idea what’s in that sealed coffin.